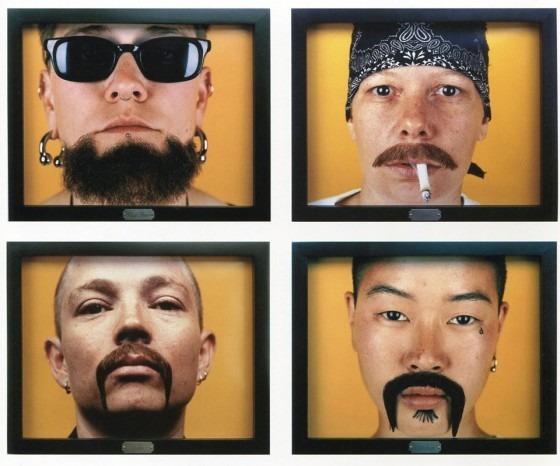 Catherine Opie, Papa Bear, Chief, Jake, and Chicken from “Being and Having” series, 1991. One of my goals this year is to be more intellectually open to works I find aesthetically challenging. Catherine Opie is one photographer whose portraits of others and self-portraits I just cannot appreciate, not because I take exception to her context, agenda, or stated subject matter, but because my eyes just don’t love the juxtaposition of flesh against patterned or fabric backgrounds. The technology, to me, is more interesting than the image itself, and it adds a level of construction, predetermination, and staging that exceeds even Opie’s elaborate theatrics.